Dolphins love to bow-ride boats, getting a free ‘surf’ from the pressure wave generated by the forward motion of the boat. In the ‘natural’ situation, they do the same trick with large whales. And they have no objection if the boat is small and fast, being easily capable of intercepting and picking up the bow wave of a vessel travelling at over 30 knots. The sight of dolphins leaping alongside a boat and jockeying for position at the bows of a boat has excited and gladdened seafarers since time immemorial and we see no rhyme nor reason in trying to prevent this. 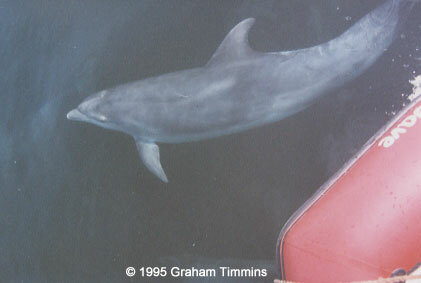 At times cetaceans may also be curious about stationary boats and may approach fishing boats hauling lobster pots, for example. At the other extreme of boat-dolphin encounters, however, we have dolphins being pursued and herded by some so-called scientists, who use speed-boats and seine nets (just as in the notorious Easter Tropical tuna fishery) in the incredibly stressful attempt to trap the animals, for the purpose of weighing and measuring them. Dolphins also get injured by propellors and of course they get drowned in fishing nets. These are all forms of boat-based harassment, injury and ‘bycatch’ which we would like to see eliminated. Somewhere we have to draw a line between these two ends of the spectrum, and the position we would choose is that chosen by the dolphins. If dolphins choose to come over to a boat and swim alongside it, bow-ride or whatever, that is fine. If people go out in boats hoping to see dolphins, and cruise around known areas until dolphins approach them, that is fine too. What is definitely not OK is to pursue or surround the dolphins, to drive boats in an aggressive and unpredictable way when dolphins are nearby, to disturb them when they are feeding, or to approach mothers with calves (who need to surface more frequently and so cannot evade boats so easily). Looking at the world as a whole, it seems clear that there are too many human beings and not enough space left for the rest of creation. Nearly all cetacean species are now endangered or under threat as a result of human activities. In some places, even benign human boat traffic needs to be regulated in order to take the pressure off local cetaceans. A case in point would be off south Tenerife in the Canary Isles, where the pilot whales became increasingly stressed through the 1990’s as a result of excessive ‘whale-watching’ activities. Again it was not the few people swimming with the whales which caused a problem but the number of motorboats and the aggressive and persistent way in which these pursued and harried the whales. In Irish waters however, excessive attention paid by boat users to cetaceans has not been a problem up till now, if we leave aside the arguable case of the Dingle dolphin. 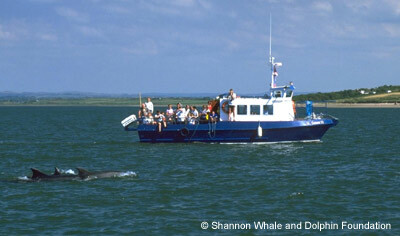 The development of dolphin-watching trips in the Shannon estuary has been achieved by responsible operators working within a voluntary code of practice, which protects the wellbeing of the bottlenose dolphins there and ensures the medium-term survival of the fledgling dolphin-watching industry. As there are no other known intense local concentrations of cetaceans in our inshore waters, any possible over-attention by boat users has so far been associated only with occasional incidents involving temporarily resident solo dolphins or presumably lost and about-to-be stranded whales. Nevertheless, with the dramatic increase in the numbers of small fast boats available to the general public in Ireland now, there is cause for concern that due care and attention may not always be taken when approaching cetaceans, and we would welcome a nationally recognised Code of Conduct to address this issue. We take heart from the success of the 100m ‘exclusion zone’ imposed around the orcas who visited Cork harbour during June 2001. What we would not welcome is a blanket ban on ‘boating with dolphins’, which we believe would be impossible to enforce, and unfair to those cetaceans which choose to interact with boats, as well as to the thousands of people who have enjoyed thrilling boat-based encounters with cetaceans.